If you're interested in being an early adopter of Google TV, for now you can choose a separate passthrough box like the Logitech Revue or Sony's Blu-ray player, or plop the whole experience into the display with Sony's new Internet TV line. We spent some time with the Sony Internet TV NSX-32GT1, and we're a bit surprised to find that it could feature the best implementation of the Google TV experience of them all. But is that enough? 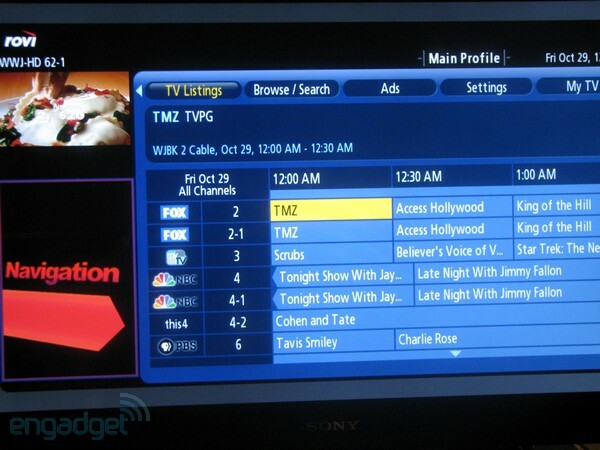 After you've digested our impressions of the platform as a whole, check out our review of the Internet TV to find out. This review is primarily of the Sony Internet TV hardware -- make sure you read our full Google TV review to get a feel for the platform itself! Strictly as a display, the appearance of the Internet TV is different from most HDTVs on the market, with a white curved back and rather unique stand. Ultimately they're just aesthetic differences, though, and getting it set up wasn't terribly complicated, although the power cord's winding entrance into the back of the TV reduced its length to something slightly shorter than we were accustomed to. Despite packing the Google TV-standard 1.2GHz Intel processor, it's not noticeably deeper or heavier than a standard 32-inch LCD using CCFL backlighting, but relatively chunky compare to an edge-lit LED TV. We didn't pick up on any fan noise, and while there's some warmth at the upper left rear of the unit, we don't anticipate keeping things cool to be problem. 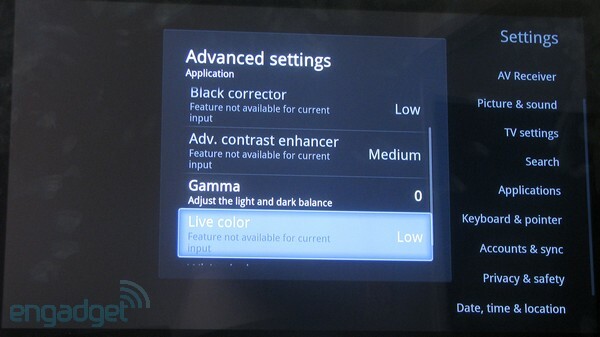 As far as what you have to actually look at, the display performance is about average, with good colors and decent black levels. We didn't notice a lot of the bloom or uneven backlighting that can occur in edge-lit units, but negatives included relatively shallow horizontal viewing angles left and a very shiny, glossy, reflective finish. Even though it's a 60Hz display and not 120Hz like many newer TVs, we didn't notice any motion blur issues while watching sports or playing games. In general, the 32-inch Internet TV performs about where it's priced as a mid-range HDTV option, although it's frustrating that buyers who want more features in their HDTV -- faster displays, 3D -- can't get them from the Internet TV line. Our Internet TV came equipped with four HDMI inputs, four USB ports, two IR blaster ports, optical audio out, integrated WiFi, and an Ethernet jack, plus a couple of elements unique to this hardware from other Google TV implementations: component ins and coaxial cable jack with an integrated QAM tuner. 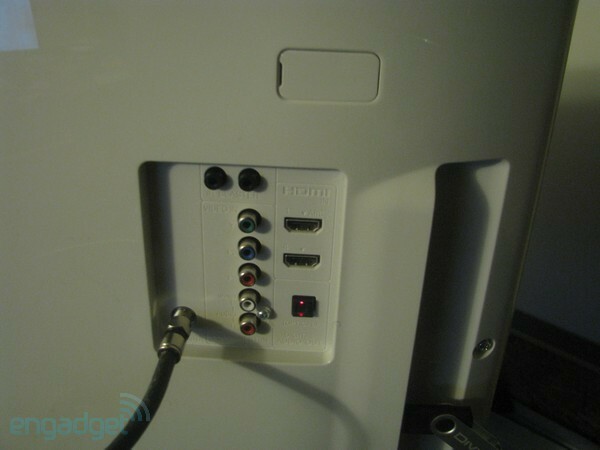 One of the HDMI jacks includes HDMI 1.4's Audio Return Channel so you can pipe sound back down to a connected receiver while the integrated speakers continue the "adequate, not outstanding" theme. The included IR blaster used easily stuck onto our Comcast-provided DVR unit, but it's not intended to cover the input, so it simply hung over the top of the box, and performed its function adequately. Two of the HDMI jacks and all four USB ports are side mounted for easy access, along with a button for syncing the RF remote and a headphone jack. One notable quirk of this TV is the lack of hardware volume or input buttons on the unit itself. It's a minor omission, but that'll be missed when you can't locate the remote and a commercial starts blasting. The display settings app appears to be fully featured and integrated with Google TV -- it's accessible through the menu or through a function key shortcut on the control pad, and it also allows for the glowing "Sony" logo on the front to be disabled at will. Oh and the remote, that many keyed monstrosity that has so been derided as 80s-ish, a Jaguar design reject, too complicated, too useless? It's actually pretty easy to get used to. One-handed or two-handed, it's light and well-balanced for a good feel in-hand, and features mostly familiar controls. We're still not in love with the optical trackpad at the upper right -- although we got better at using it to mouse around after a few days, we never got 100% accurate or experienced the level of responsiveness we'd like to see. 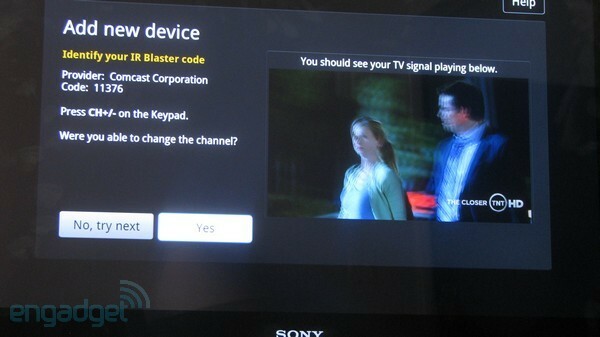 As a universal remote controlling the cable box via IR blaster, it was still effective, however. The playback keys mapped naturally to the DVR and were very responsive, but we did find a few things that will probably prevent it from being your one and only remote on the living room table: jumping back to a previous channel was confusingly and unintuitively mapped to the Tab key, and while it was easy to use once we found it, there's no indication of what button does what during setup. We also were unable to find a way to replace certain functions of our cable TV remote, like paging up and down through the guide, so it's possible you'll need to keep that around for the time being. The keyboard itself had a quality, responsive feel and we were able to fly though text input when necessary. Unfortunately there's no support at this time for programmable or learning functions, so you're stuck with what it's capable of out of the box. There are no remote apps available currently, so we couldn't test out what control from a phone would be like. 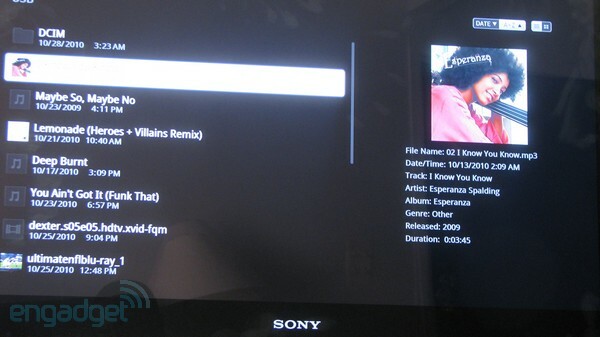 We found Sony's implementation of Google TV worked well, with a relatively easy setup process that anyone could walk through. The main adjustment we had to get used to was treating TV like any other app running on Android. Simply opening something else like Twitter or even Chrome instantly kills whatever you were watching, unless you had the presence of mind to take advantage of the Dual View button on the remote first to put things in picture-in-picture. It's a decidedly different approach to other smart TV platforms like Yahoo! Widgets that are designed to function as a sidebar to whatever is on, and right now, we're not seeing it as a better one. When we're watching TV, we want to keep watching TV until we say otherwise, and there's an extra step that gets in the way. Dual View should be the main selling feature of the Google TV experience, and it's great to have running -- we pumped Yahoo's Flash page of live updating fantasy basketball scores while also watching several games in PiP -- but it's also where we found our biggest gripe. When you hit the button, while it may not be a shift in resolution, it definitely takes a second or so to kick in, during which you're treated to no sound or video at all. It's not the longest pause ever, but it's incredibly disconcerting and breaks up the TV watching experience. After that, the inability to resize or reposition the window are our next major gripes, as well as that apps don't recognize when it's there and may position critical UI elements in a suddenly inaccessible area of the screen. The Internet TV is unique among Google TV devices in its ability to accept video over component input and also via coaxial cable, though in practice, they're largely the same experience as operating with an IR-controlled set-top box. After letting the QAM tuner find the available channels from our cable company, pressing the guide button launched the integrated Rovi EPG app that asked for our location and service provider before announcing it would download guide data while the TV was off. It integrated into the Google TV search platform just the same way, although the software didn't automatically find and tune to our HD channels, since they're on subchannels (NBC is channel 4, NBC HD is channel 4-1), so we had to find them ourselves. Otherwise, PiP and overlays worked exactly the same on those inputs and with the same responsiveness as HDMI. Pulling in content from the launch set of apps was largely the same as any other Google TV product, while Sony included its Qriocity movie service and a "Sony Recommends" shortcut. The included media player streamed music, movies and pictures from shared folders on our Windows 7 PC through DLNA and UPnP, and also played back a few DVDRips from a USB stick, although we couldn't manage to switch between two different USB devices when we had them both plugged in. Otherwise it's as barebones as can be: it displays album art, and multitasking allows for it to play music and do a picture slideshow together, but don't expect to create or edit playlists within the app. The other apps are as noted in our original review: we probably enjoyed NBA's GameTime highlights the most, although the heavy compression tended to obscure player faces once they got moving. If you're looking at this as a cord cutting opportunity, as we mentioned in our platform review, it all depends on how much you enjoy the available Flash video sources. Whether or not Google TV is truly the future of the television watching experience remains to be seen, but Sony's Internet TV specifically does a good job of leveraging what's there with an existing TV experience and quelled many of our installation fears due to its simple setup process. Unfortunately, the platform's current drawbacks and the television's middling display specs make it a tough one to recommend even to early adopters. If connectivity, web access and the potential of Google TV speak to you, we can see it as a worthwhile purchase. At about a $100 premium over Sony's similarly spec'd EX600 HDTV it's not too expensive of a bet to make if you're already in the TV market, but the problem with buying on potential is that it leaves precious little wow factor for you rely on right away.